Optimum Security is one of Courtenay’s premier security service companies. We provide security services to both residents and business owners throughout the Courtenay area. 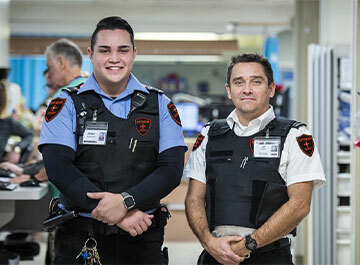 Our staff includes trained security guards who are available for on-site security monitoring and work closely with law enforcement throughout the area to ensure our clients’ safety. Learn more about the type of security services our company offers. Hiring a uniformed security guard to monitor your home and/or business while you’re away, giving you the highest level of protection possible. Our guards are uniformed to maintain a high level of visibility, which helps deter any potential criminal activity. Our security guards monitor your property on site, using a mixture of alarm monitoring, watching video cameras, and patrolling the area for any signs of trouble. If one of our guards spot a problem, you can rest assured that both you and the authorities are contacted immediately so that the problem is resolved properly and quickly. Our security services are designed to help Courtenay residents and business owners protect their property, assets, and anyone on their property. Call us today to schedule a consultation, and discover how we can help protect you, your family, your valuables, and your property.